December 19, 2016 ~ Lorra B. 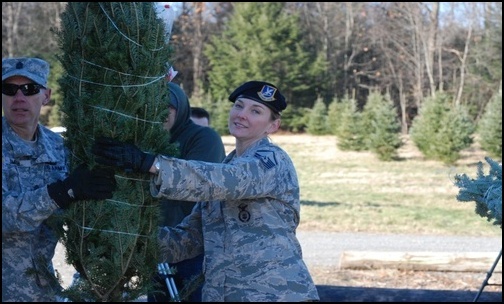 Since it’s launch in 2005, the Trees for Troops program has delivered over 176,000 Christmas trees to military service members and their families. This year Fedex have once again joined with the Christmas SPIRIT Foundation and they have added 18,000 more trees to that impressive list. Christmas trees have been delivered to families located on 65 bases in 17 differed countries, according to Fox News. A report by NBC 12 stated that in total FedEx drivers have driven over 350,000 miles delivering trees since the program started. Trees for Troops is in its 12th year of bringing holiday cheer to our troops and their families. But they can’t do this on their own and need your help. “Imagine a smiling group of U.S. troops gathered around a Christmas Tree that was grown on an American farm and shipped to arrive fresh and green somewhere on the other side of the world, just in time for Christmas. Or, imagine a spouse and children sharing joyous memories of Christmas through the gift of free, real Christmas Tree while their family member is away serving our country. Trees for Troops® makes this vision a reality! If you are interested in helping, Please visit treesfortroops.org. This entry was posted in Military, News, Politics and tagged conservative blognetwork, FedEx, Trees for Troops, US Military. Bookmark the permalink. What a great work for the morale of our troops! Thanks for sharing! You know, I’ve never been much of a FedEx fan until now. Now I really think something pretty special of them! By the way…the snowfall effect is really cool. But it’s the closest I want to be to snow, make no mistake about it!!! Just make sure you keep the snow in your side of the desert!!! I gave my snow thrower away when I moved out here!!! Reblogged… from Word Press …. Thanks for the post. That’s very sweet. I hope the troops felt a little closer to home because of that kindness. Nice. A bit of home. Love to hear these types of stories during the holidays. Perhaps during the Trump administration, all but the hateful will get the program and we can have peace and goodwill 365 days a year, for those who can’t coal will do. The least we can do for this most under appreciated that make such tremendous sacriice. You’re welcome. Merry Christmas to you too.